Should you be unable to see the screen shot, a popup window comes up that reads: “What is the square root of a fish? Now I’m sad.” This message only appears to players who have pirated the game. The player can then simply click out of the popup. Or, if you’re Dan Hibiki, a.k.a. 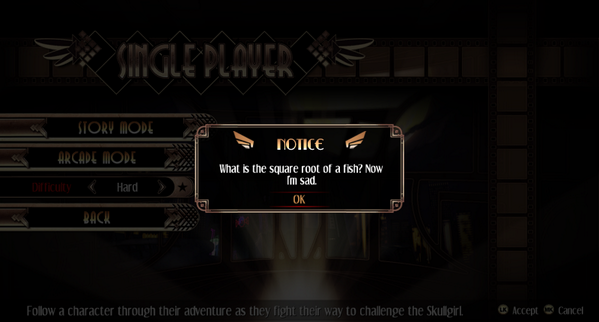 @SaikyoChamp on Twitter, you can tweet at the Skullgirls developer, Lab Zero Games, and ask them what’s up with the message, which is exactly what he did. The official Skullgirls Twitter account tweeted back at him suggesting that he buy the game instead of pirating it. Head over to Techdirt to see the full exchange (it’s worth the read). Next Next post: … and how is this our problem?